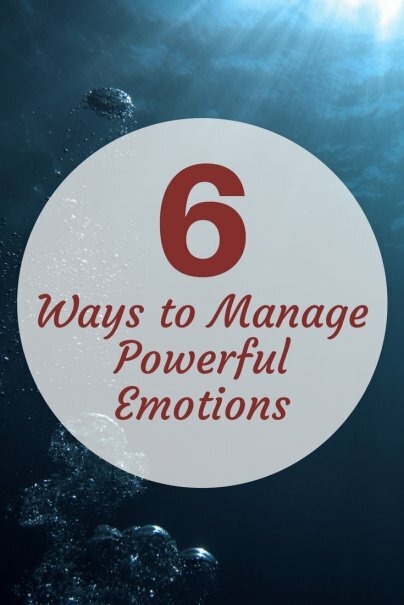 Everyone has an emotion or set of emotions that feel more powerful to them than the rest. When these include the so-called negative emotions — sadness, anger, frustration, pain, etc. — it’s easy to feel entirely engulfed when the emotion comes upon us. Even if you can’t get out of whatever situation is causing the strong emotions, you can take a brief pause. Many times, all you need are a few seconds between the onset of the emotion and your response to ensure that you are in control and that you’re not just responding with your first reaction. Everyone says it, but here’s a news flash — they say it because it works! When you’re feeling something that threatens to overwhelm you, take a deep breath. Then take another, and another, and within a few breaths, you will feel better. The feeling probably won’t go away entirely, because strong emotions don’t do that, but you will regain control over yourself. Most strong feelings initiate an adrenaline response. When you’re pumped full of adrenaline, you’re more likely to take actions that you’ll regret later. Breathing deeply helps counteract that response. Any feeling, no matter how strong, will eventually dissipate. There will come a time when you are not nearly as upset as you are when the feeling first hits. Reminding yourself of this can help you calm down quickly. Tell yourself, over and over, "This is a feeling. It will pass." While the offense or situation that caused the feeling will still exist, knowing that you can deal with it after the feeling dissipates will help you regain a sense of power in the situation. If at all possible, find some way to be alone before you have to respond to the situation. If this won’t work in your situation, then take some time to be alone afterwards. Being alone will give you some time and space to process what happened, why it upset you so much, and what you can do to respond to the situation (or whether you responded the way you’d like to respond). If you need to, find some way to get the strong emotion out of you. For some people, breathing deeply achieves this. Others, though, will want to hit or kick something (if this is you, invest in a punching bag, please! ), yell, cry, or talk to a friend. The important thing is that you learn what works for you and that you apply it. Getting a feeling out not only means that you don’t have to keep feeling it, but it also means that you won’t carry it around. Unexpressed feelings can fester inside a person, leaving them tired and, sometimes, bitter and difficult. Get your feelings out, and move on. Once your feelings are out, or managed as best you can in the situation, choose how you want to respond to whatever caused the powerful emotion in the first place. Remember, your emotion and your action are always two separate things. Just because you’re feeling a certain way does not mean that you have to respond with a certain action. You’re in the driver’s seat, and so you can choose the response that is most helpful in your particular situation. In nearly every circumstance, calmer is better. The more you can remain calm in the face of your strong emotion, the more appropriate and effective your response will be. You can communicate strong emotions calmly, which gives the other person the chance to respond in kind. When you’ve chosen your action, follow through with it. Seeing positive results from this will help you choose to manage your emotions and choose your responses next time, too. How do you manage your strong emotions? I am a very emotional person, in a weird way. I'm not hyper-emotional, in that I am not overly-sensitive. However, when I do feel something, I feel it strongly. The deep breath thing is no joke- but yes it is easier said than done. Not until you have an incident, such as a crying attack, will you be able to identify the warning signals. The deep breath has to be perfectly timed in order to be effective. lol. Now I can always tell when I'm getting heated, or when I want to cry and nip it in the bud. I think the key to managing these emotions is to be real about the fact that you are having them. Too often, in the workplace or with someone for whom's feelings you do not want to hurt, you repress. Then something much lighter may happen to you and you explode (and say something inappropriate). If someone hurts you, just be honest with them. Respectful, but honest. It'll help you keep your feelings in check. Pausing is the best way to prevent an emotional outburst. I know whenever I get angry or overly emotional, I always take my time to respond and speak very slowly to ensure that I process what I am saying before I blurt anything out that I may regret.